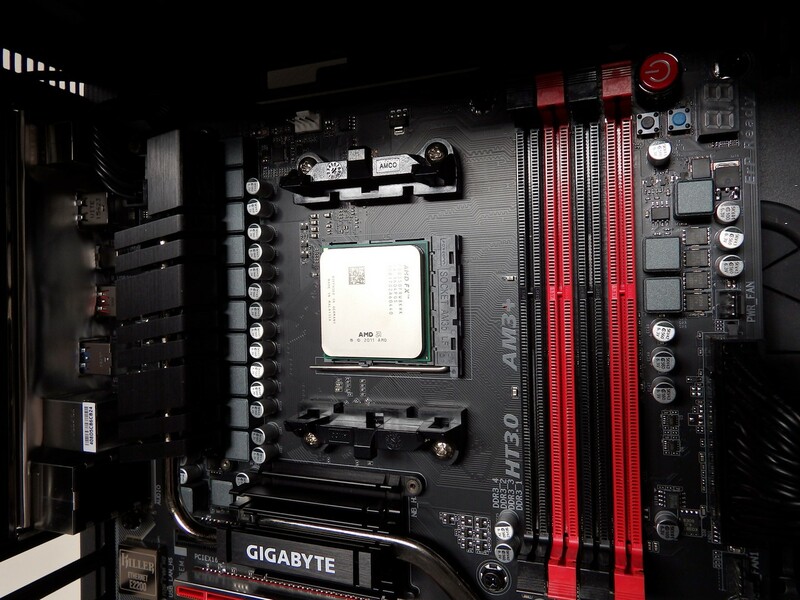 Historically, we haven’t spent much time with AMD processors or technology. 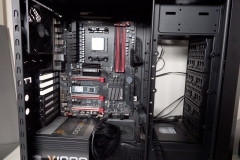 Now that we have a dedicated AMD test bench on hand this is going to change. Our test benches in the past have always been Intel/NVIDIA based systems for no other reason than the review samples we’ve had on hand. 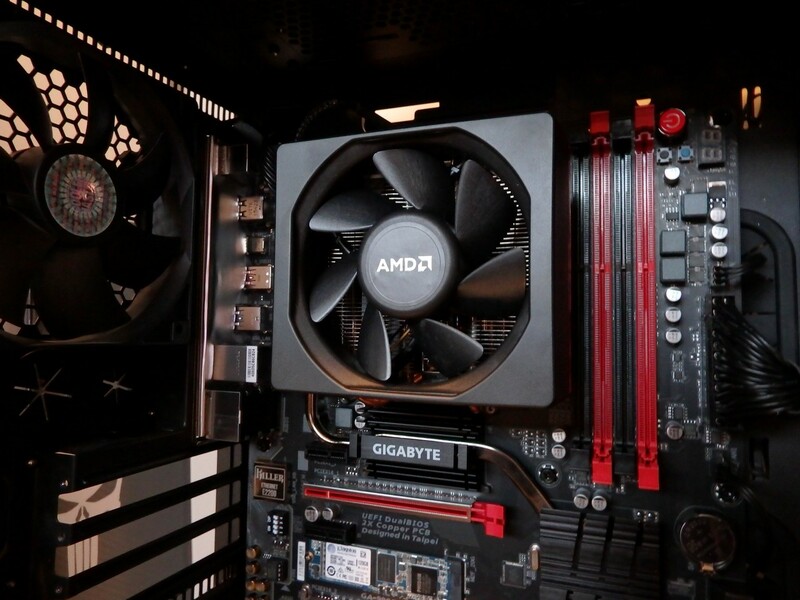 Recently, we had a discussion with AMD about running an ‘all-AMD’ test system to test things like DX12, the new Wraith ‘stock’ CPU cooler and also to get a handle on the gaming experience across all of our library as well as some long term experience with drivers and windows updates. With new CPUs and GPUs on the horizon, it also seemed like a good way to establish a benchmark for the gains of new technology from AMD. 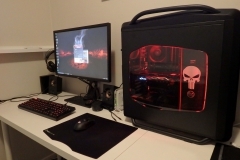 You can email any questions or benchmark requests through to feedback@pcgamers.net.au or feedback@pctechreviews.com.au and we will try to answer in our regular updates. Let’s address the elephant in the room first. 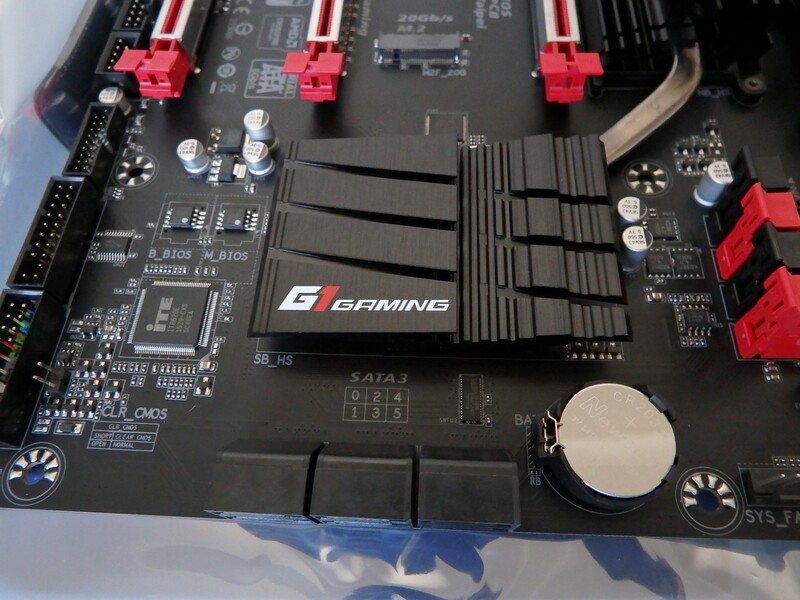 The AM3+ platform is old and in the twilight of it’s retail life but it can still represent good gaming value depending on the technology that the manufacturer decides to include with the motherboard. 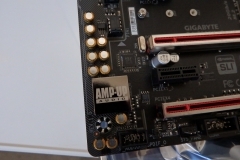 If you look at the longevity of the AM3+ socket, AMD has given their customers a good run with regard to platform stability and cheaper upgrades due to compatibility. 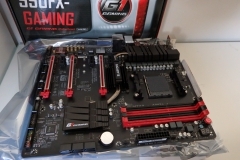 CPUs have been supported for longer as has DDR3, motherboard manufacturers have also created motherboards to support some connectivity not native to the chipset as well. 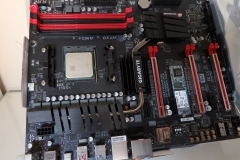 On the other side of the fence, Intel has more regularly changed the socket design which resulted in a need to change the CPU and motherboard with each step forward in other technology. 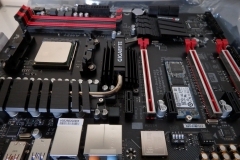 Motherboard manufacturers stopped making Intel socket 1156 and 1150 motherboards when the next chipset came out so if you have a CPU that’s a couple of years old and you want to buy a new motherboard for it, you will either struggle to find an unused one in stock or else you will need to pay a premium. 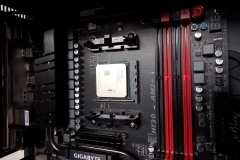 Over the past few years, the gaming community has seen AAA titles come a long way but most of the progress has required graphics card updates and increased storage but not so much attention was required to upgrade the CPU. 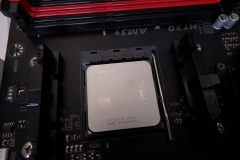 This worked in well with the capabilities of the AMD FX CPUs, allowing gamers to stick with their core platforms a little bit longer. 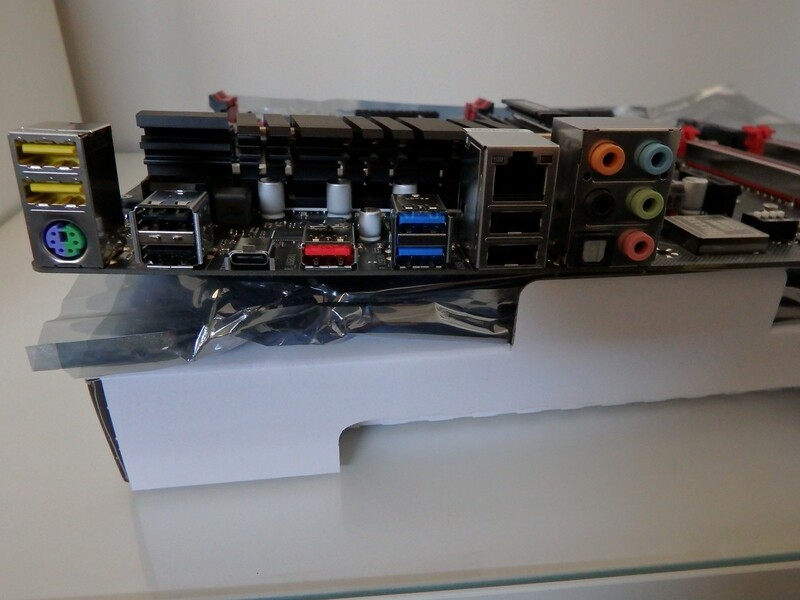 We see queries from readers about AMD gaming rigs, usually value related so this project will also allow us to test performance as well if we have the title in question. 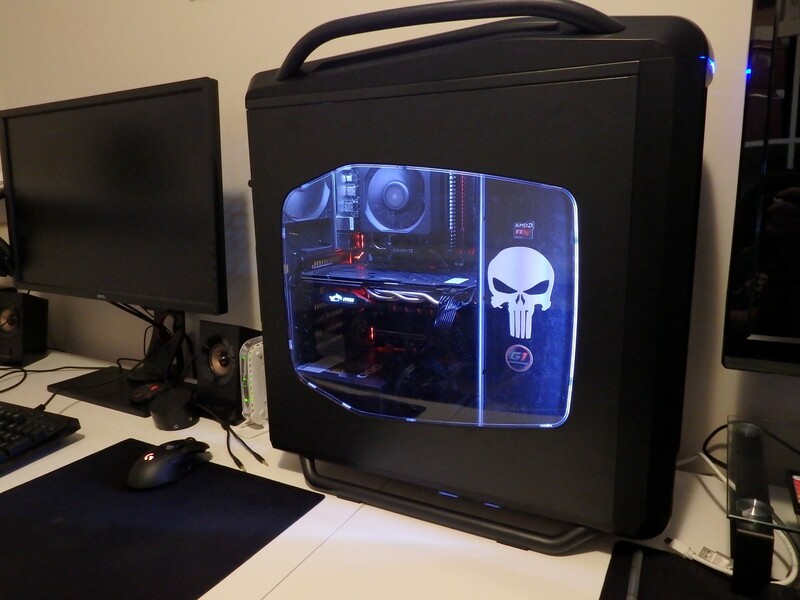 The premise for this build is gaming – not rendering videos, running Virtual Machines, crunching numbers to solve the world’s problems or live streaming. This project is about gaming – pure and simple. 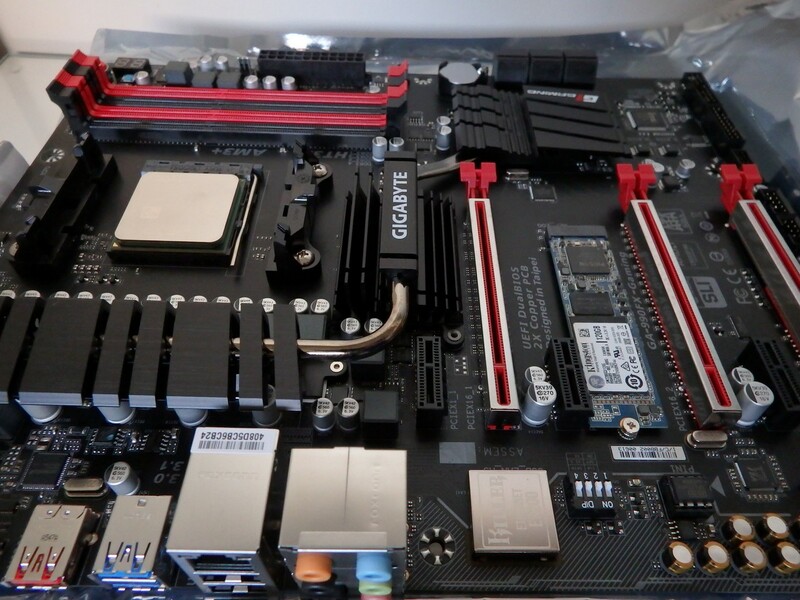 The other thing to note is the cost/market value of the system when comparing it to other systems like our much more expensive high-end MSI X99S Gaming 7 HASWELL-E test system. 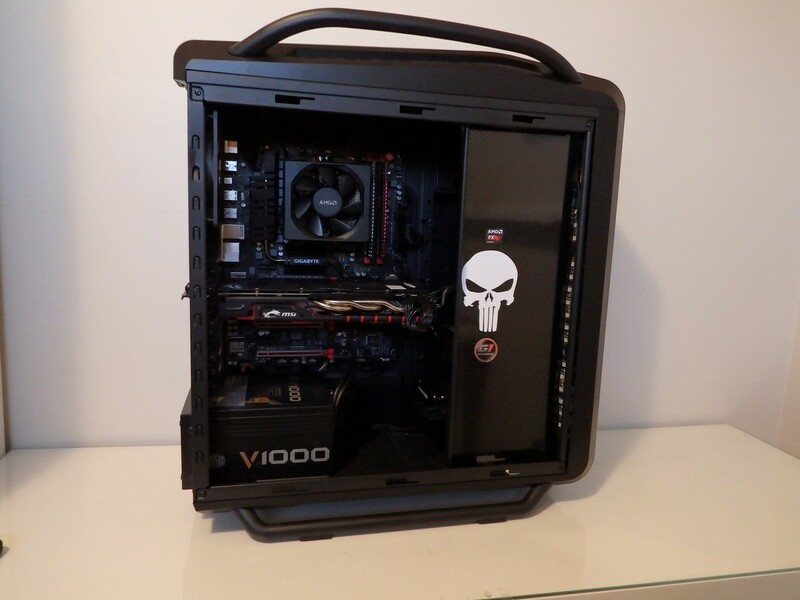 All parts for this build were provided by vendors at some point, either specifically for this project or for reviews in the past. We hold onto products here and don’t sell or discard review samples so that projects like this are possible. 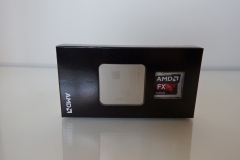 For the record, AMD provided the FX-8350 CPU and Wraith cooler. 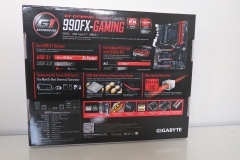 Gigabyte provided the 990FX-Gaming motherboard in conjunction with AMD. Western Digital also sponsored a 6TB Black hard drive specifically for this project. The rest of the components were samples from previous reviews or concept builds. 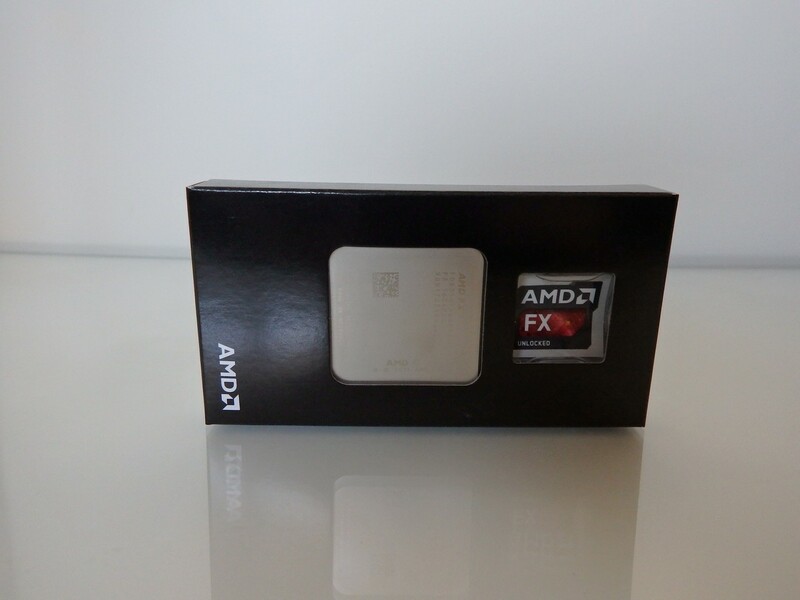 With 8 cores of grunt at 4.2GHz, we expect the FX-8350 to hold its own but time (and a lot of gaming) will tell. 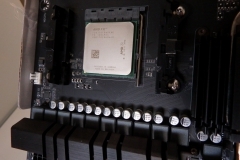 In our early testing, we are yet to find a game where the CPU is a limitation. 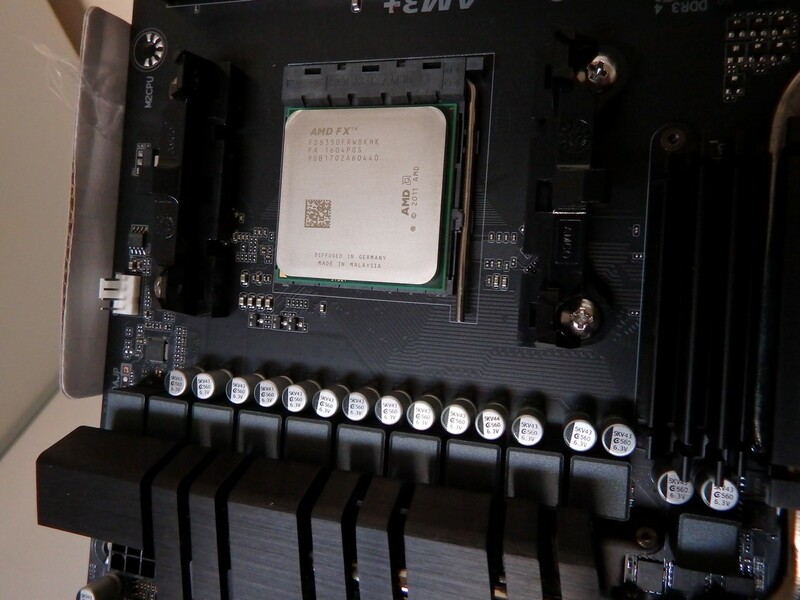 We are really keen to see if any games bottle necked this CPU and to what extent. 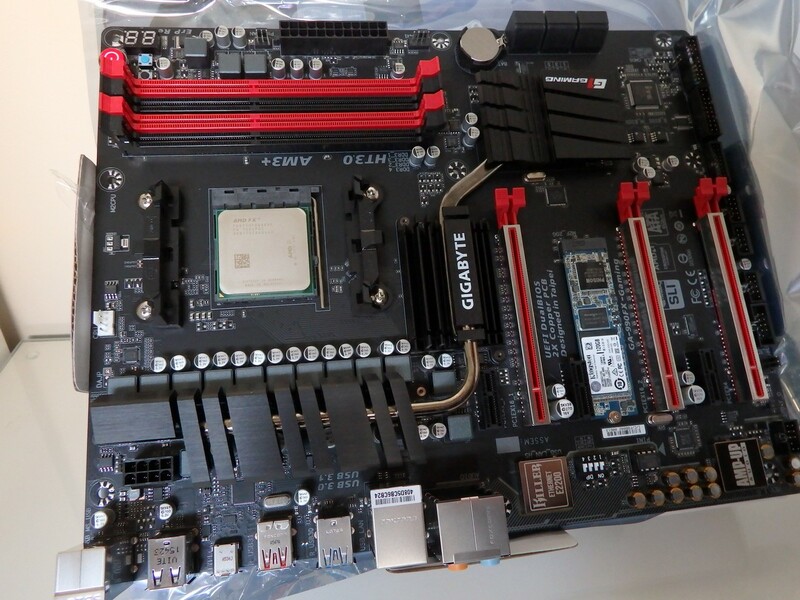 Overclocking is also an area that we want to look at but it isn’t a major focus as it can vary between processors but for the record, 4.5GHz via the Gigabyte presets in the software was a one-click affair and it has been rock solid for a few days at this stage. 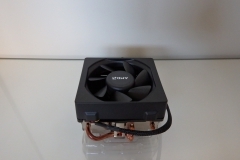 It is widely accepted as fact that the previous stock cooler provided by AMD was an acoustic abomination. We don’t use stock coolers in the lab or in our concept builds and whilst there isn’t a policy against it, there is an unwritten rule and this goes for Intel as well. 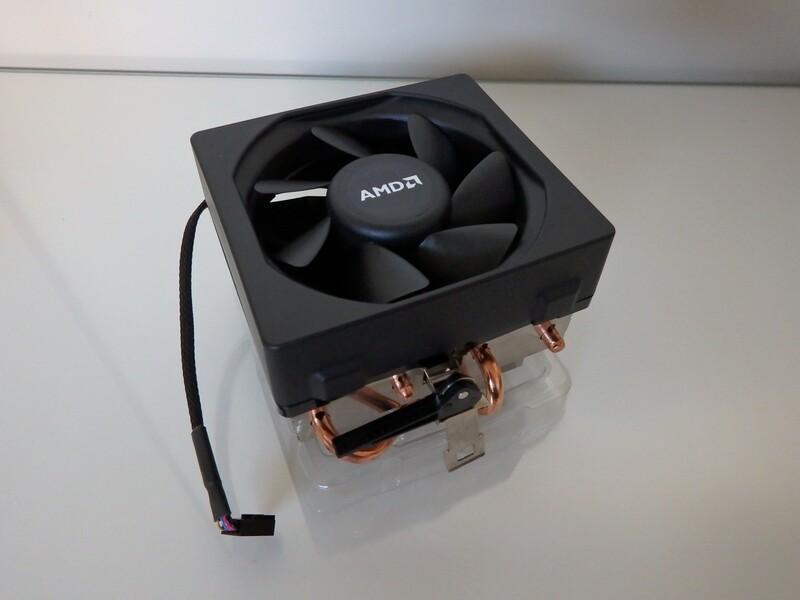 After seeing all the press about the Wraith cooler from AMD we are really keen to see how it goes because this could be a $50-100+ saving for consumers. 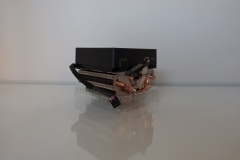 The Wraith doesn’t have to rival Noctua for many gamers on a budget, it just has to be “quiet enough”. 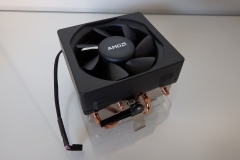 The Wraith cooler also has a subtle white “AMD” LED lit logo on the side of the cooler which is a nice touch for a stock unit. 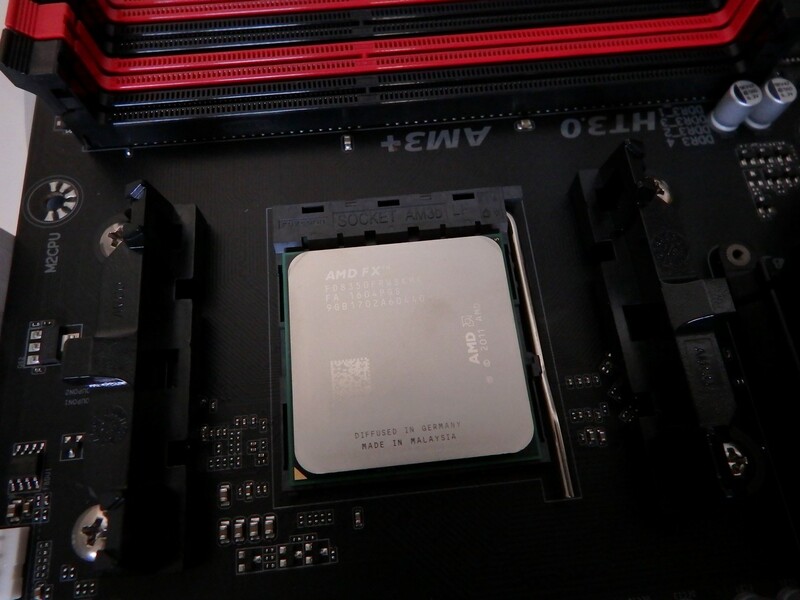 The Wraith is the first thing we want to cover in future articles from the AMD Test Bench. 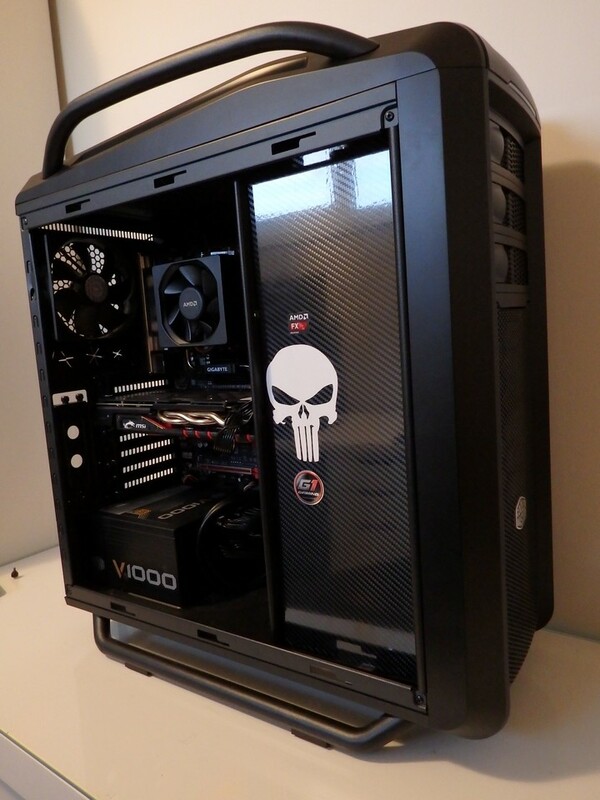 If initial impressions are anything to go by, this could be the best ‘stock’ cooler we’ve seen to date. 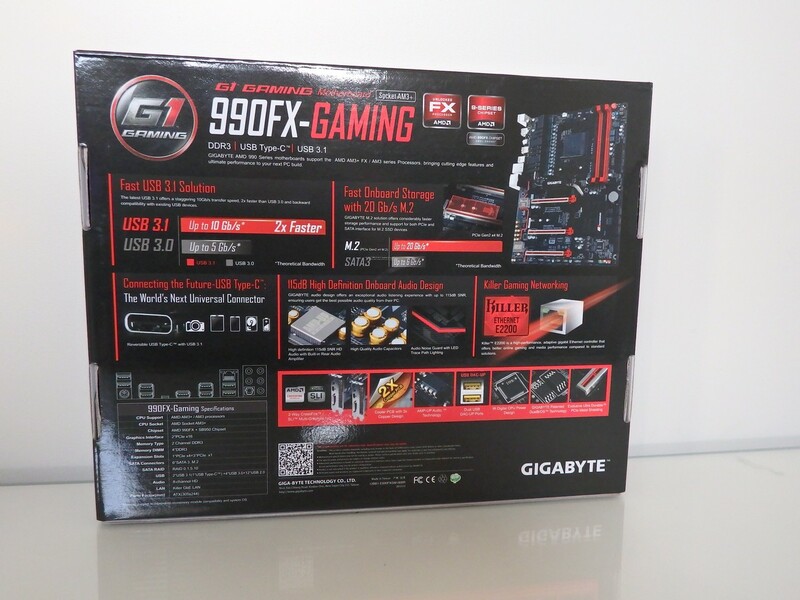 This board surprised us, it has everything a gamer needs with awesome build quality and will stretch the useful lifespan of ageing CPUs. 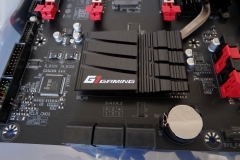 We see the modern technology of USB 3.1, Type C connection, SLI and Crossfire multi GPU I support and an M.2 slot all implemented and logically laid out. Killer LAN, Enhanced audio with the ability to customise the amplifier and dedicated USB DAC ports are features that gamers will appreciate. The USB 3.1 and Type C will be more important for VR moving forward. 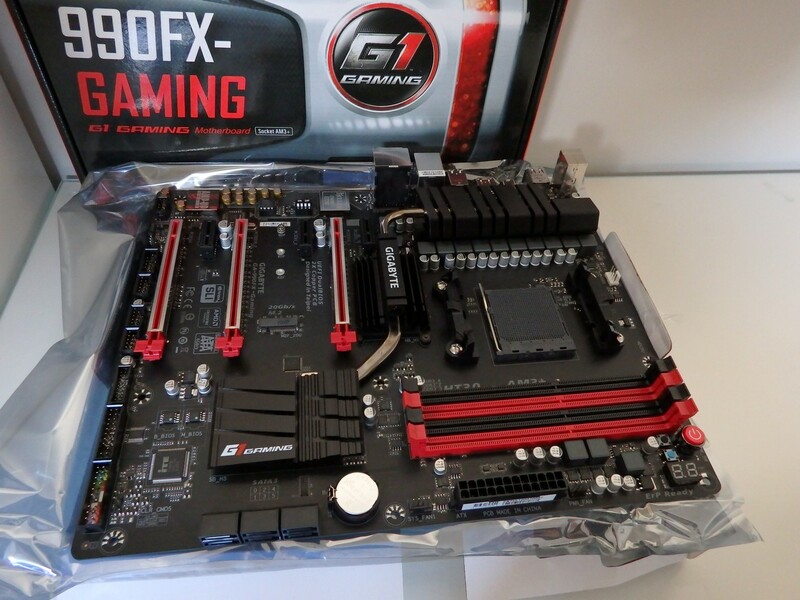 The 990FX-Gaming board is both a legitimate and cost effective upgrade to older AM3+ boards as well as being a competitive option for a new build on a budget. 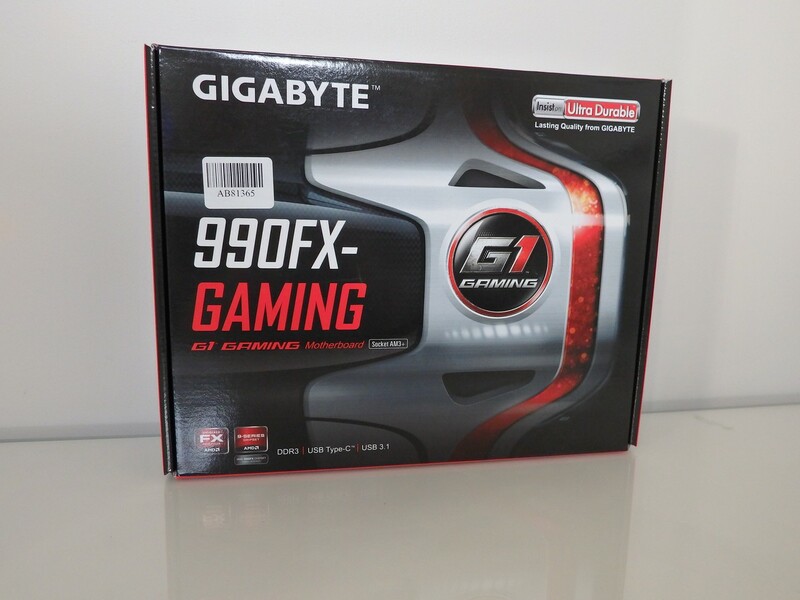 Gigabyte also brought their ‘A-Game’ with the software package and driver support – having just reviewed the Gigabyte Z170N Gaming 5 mini ITX motherboard, we felt right at home with the installation package and software utilities bundled with the 990FX-Gaming. 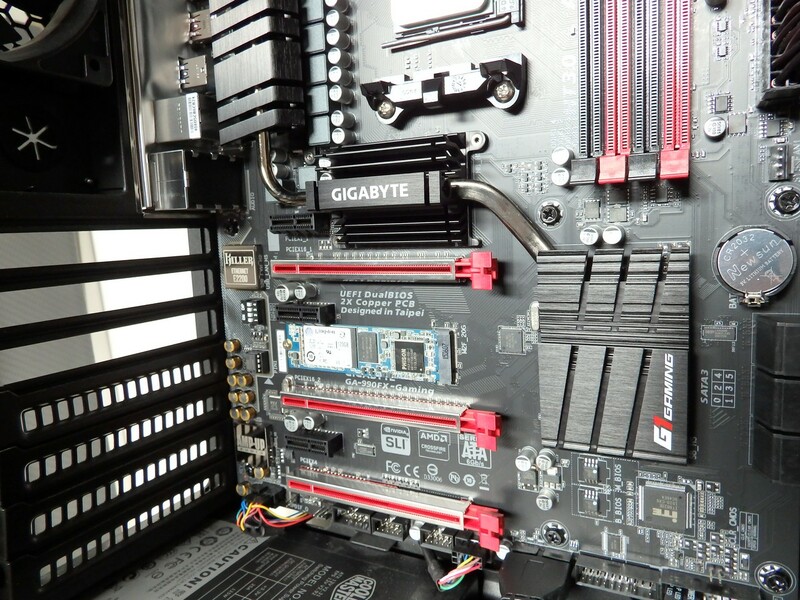 High level specifications are listed below, we’ll cover this board in more detail in a future article but it was really easy to work with and the setup was done in no time at all. Priced at ~$249, it’s worth a look. 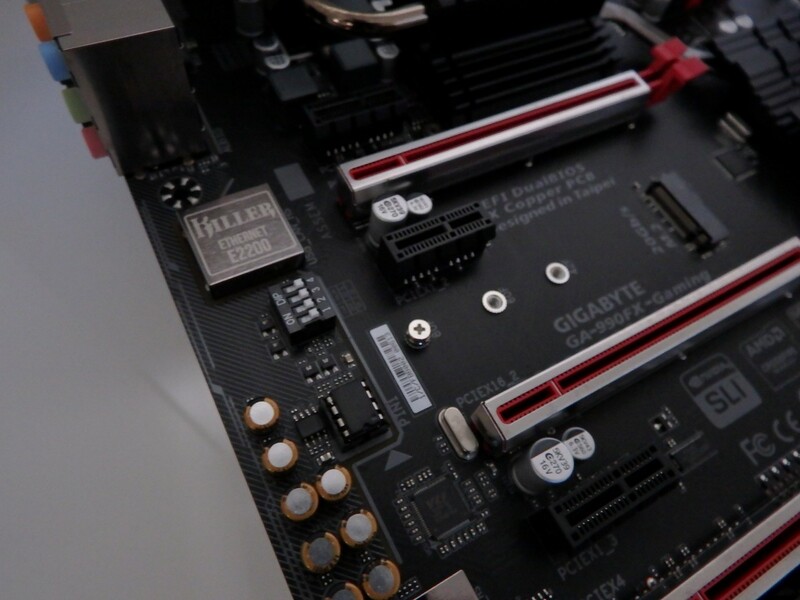 ADATA provided us with a 16GB set of XPG V3 DDR3 in 2015 for review and a project we were working on – which worked in well with the DDR3 requirement of the 990FX Gaming motherboard. The removable gold heat spreader was painted white for a previous showcase build and we still had the red set so we ended up going with a red accent module and a white accent module. 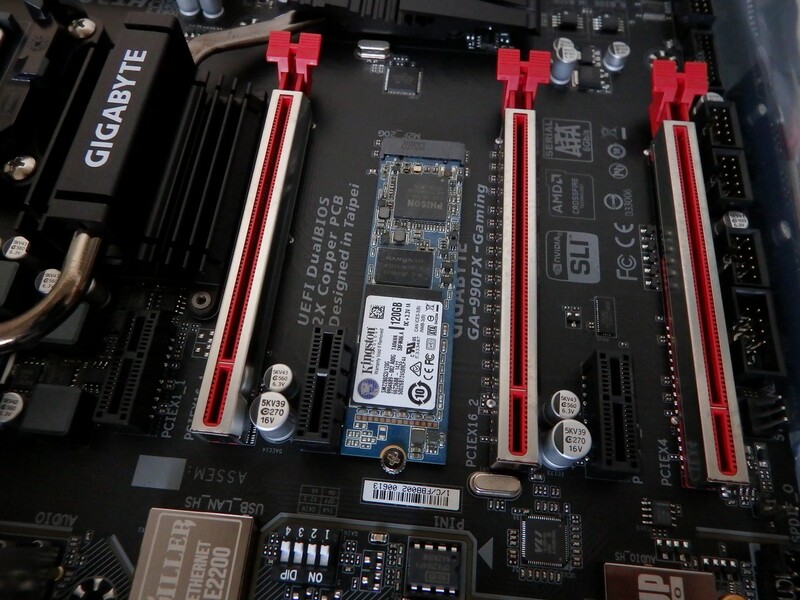 The video below demonstrates how easy it is to change the aesthetic of the ADATA XPG V3 memory kit. 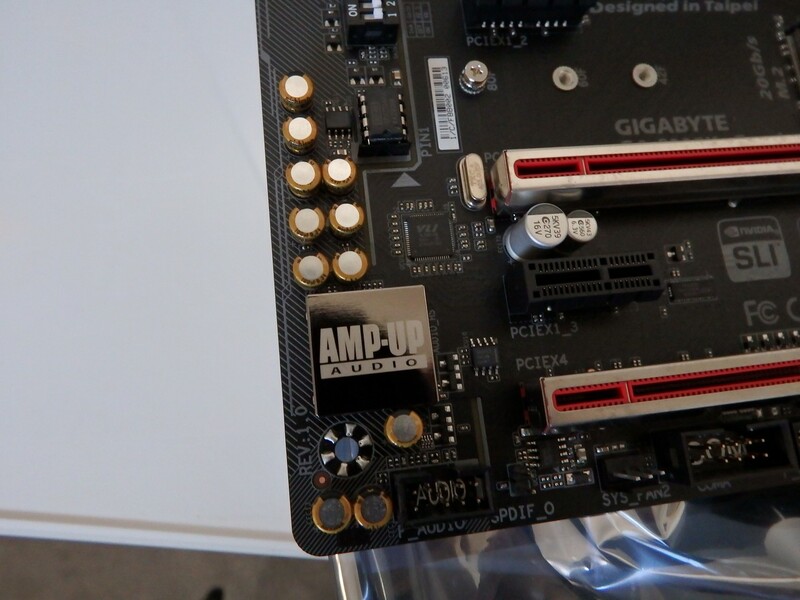 We really hope that they make one of these in DDR4. 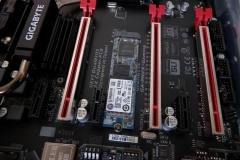 Kingston provided us with a 120GB M.2 (2280) SATA drive last year for review and we used it in the MSI X99S Gaming 7 Test system for about 12 months. 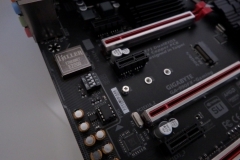 The SSD uses the PHISON PS3108-S8 NAND controller and made a nice addition in the M.2 slot on the 990FX Gaming motherboard as the boot drive. 120GB might not seem like much but when you turn off the paging file and disable hybernation (“powercfg /h off” at a command prompt with Admin rights) you have more space to work with. 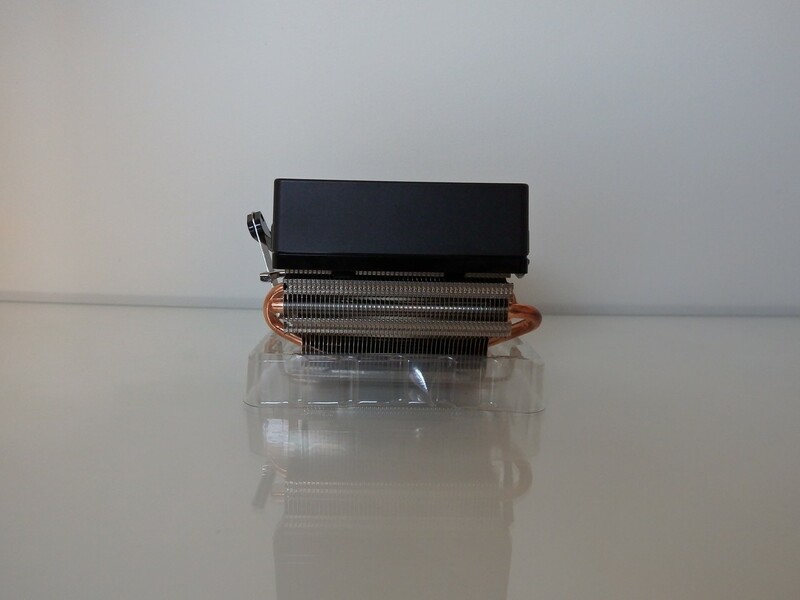 Western Digital chipped in here to make sure that we weren’t cutting corners and provided a WD Black 6TB drive. We estimate about 2.5 – 3TB for the game libraries and the rest will be used for captured gameplay. The initial testing of this hard drive was very impressive and it is the fastest mechanical hard drive we’ve seen in the lab to date. 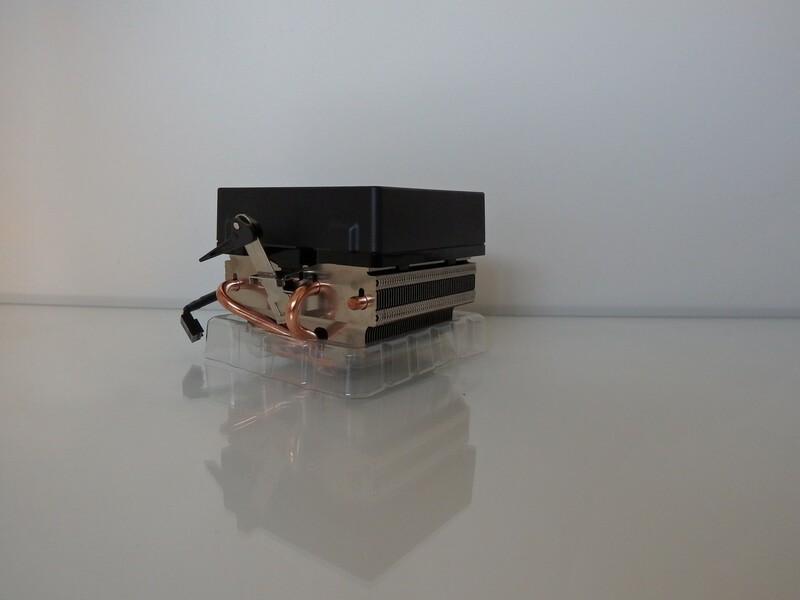 The surprising thing about the WD Black 6TB was the noise levels – we were expecting it to make more noise but the drive is very quiet inside the Cosmos SE case. 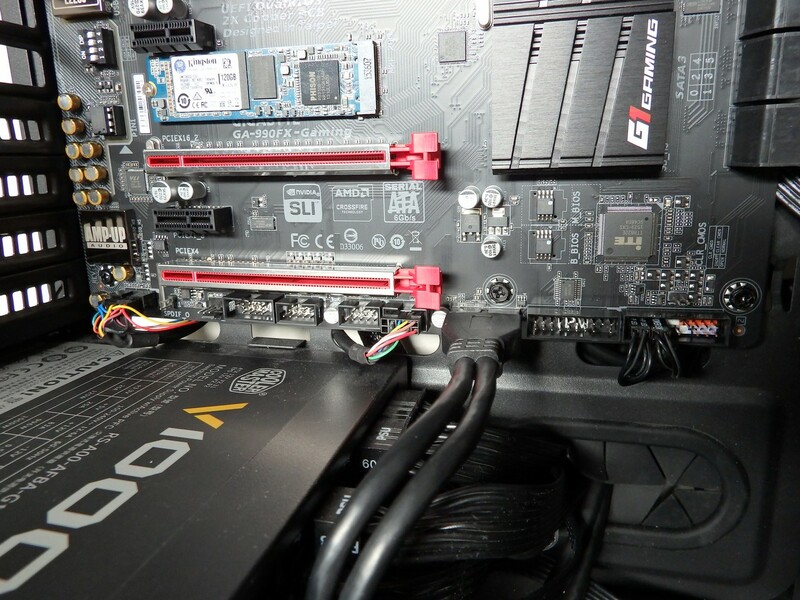 The only Radeon graphics card in the lab is the MSI R9 380 Gaming 4G review sample from last year. 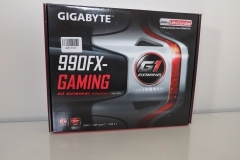 We consider this to be good for gaming at 1920×1080 and ok under some 2560×1440 gaming conditions. The card is worth about $285 at the time of writing so keep that bargain price in mind. 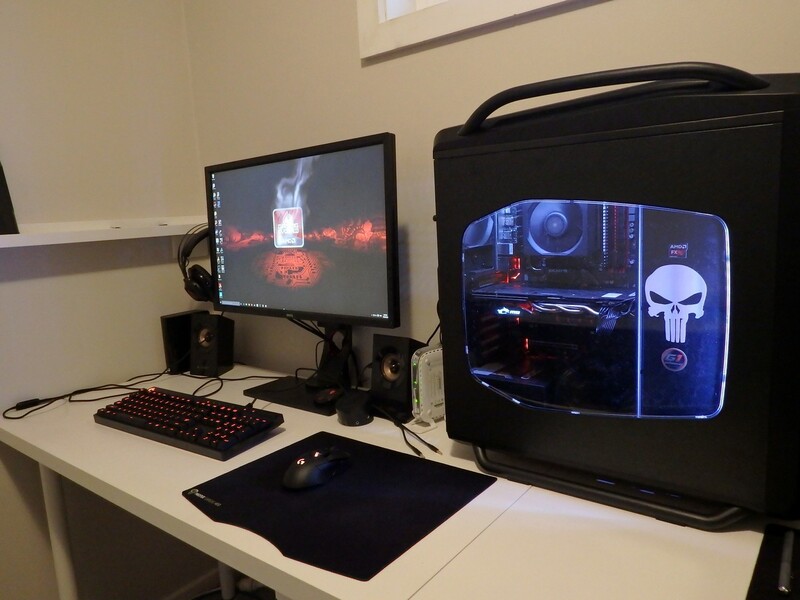 It supports FreeSync so it’s a good match to our BenQ XL2730Z monitor via DisplayPort. 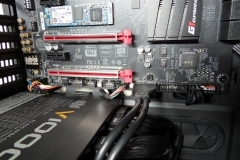 The MSI version of the R9 380 also has the Twin Frozr V cooler that makes very little noise which also helps to keep the noise down. 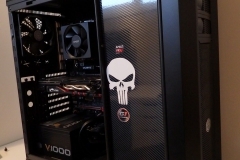 The red/black aesthetic, slick backplate and bling of the white MSI logo also went well with the overall finish we were looking for. “The Baby Cosmos” as it is affectionately known in the office is a favourite. 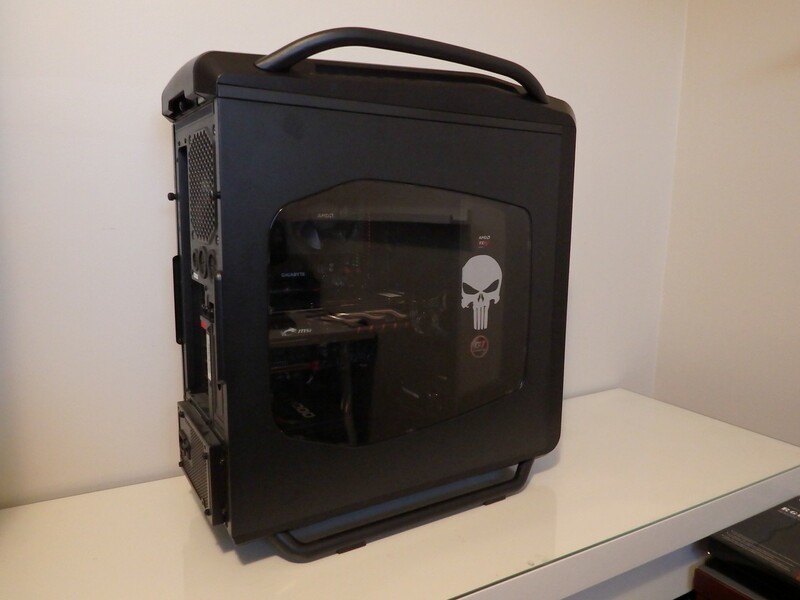 We originally received this case for our ‘Beast’ build last year where it housed the X99 test bench. 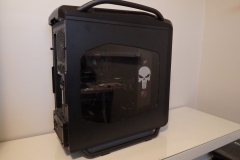 The drive bays were stripped out with the exception of the bottom 2, a thin cosmetic panel was made and wrapped in vinyl to cover up the drive bay area and we then used a ‘Punisher’ decal centred to suit the window. With some LED light strips, the facelift became quite effective yet ridiculously simple. One thing that we really like about the Cosmos SE is the handles – they are really sturdy and for a rig that will be moved around a lot, this is going to come in handy. We’ve always liked how easy it is to build in the Cosmos SE in addition to the aesthetic appearance so it was great to have the case on show again. All up, the build came together in about an hour but it would have been quicker if we weren’t making notes and taking snap shots along the way. 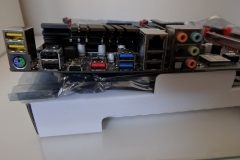 A 1000W power supply could be considered overkill but it was what we had available and it does give us some headroom for testing dual cards in the future. 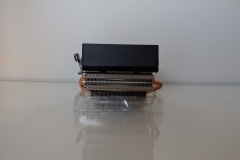 the high rating also means that the fan should operate at low speeds due to the low percentage of load on the unit. The V100 is modular so we only connected the cables that we needed to get this rig going and had less cables to conceal. Deep Cool provided us with some of their remote controlled RGB light strips to ‘bling up’ a showcase build at Respawn LAN last year. 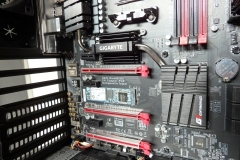 The kit allows for up to 2 light strips, has an infrared remote and plugs into a Molex connector – it is relatively easy to conceal and simple to install. As luck would have it, there was a set left over and it turned out to be exactly what we needed to give the AMD Test rig some custom RED lighting. The white light also works well and makes it easier to see the internal components through the side window. The opinion in the office was divided as to red or while lighting but thanks to the credit card-sized remote we really can have each to their own! 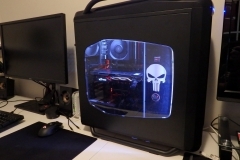 The above build worked perfectly from the first press of the power button, Windows 10 installed in a flash and it then took over an hour to copy across and install all of our game libraries over the network. 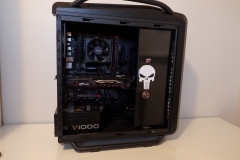 This is one build that really went together without a hitch. 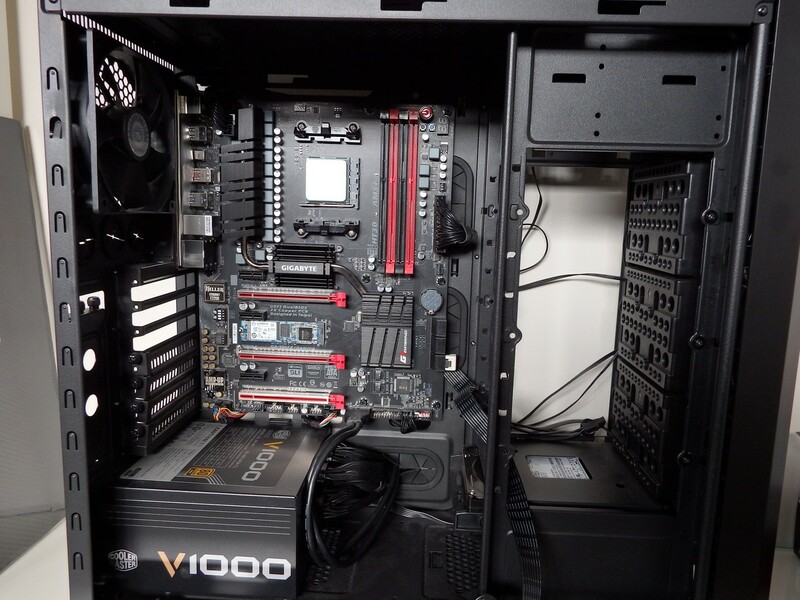 Keep in mind that there are a few overkill components like the 6TB hard drive and the 100W power supply that could be scaled back with the savings of around >$400 redirected to an upgraded graphics card. 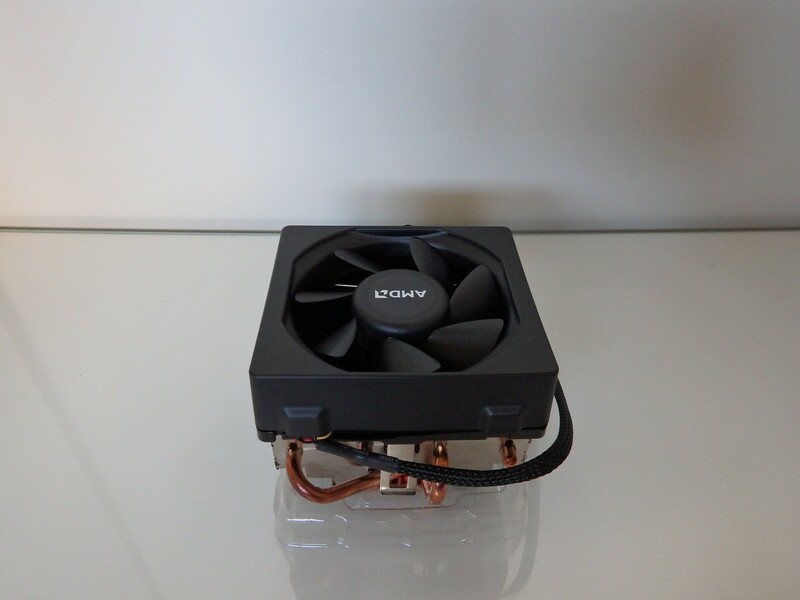 With a mountain of benchmarks to finish and other tweaks to occur in the near future, the most likely next change will involve the case fans. 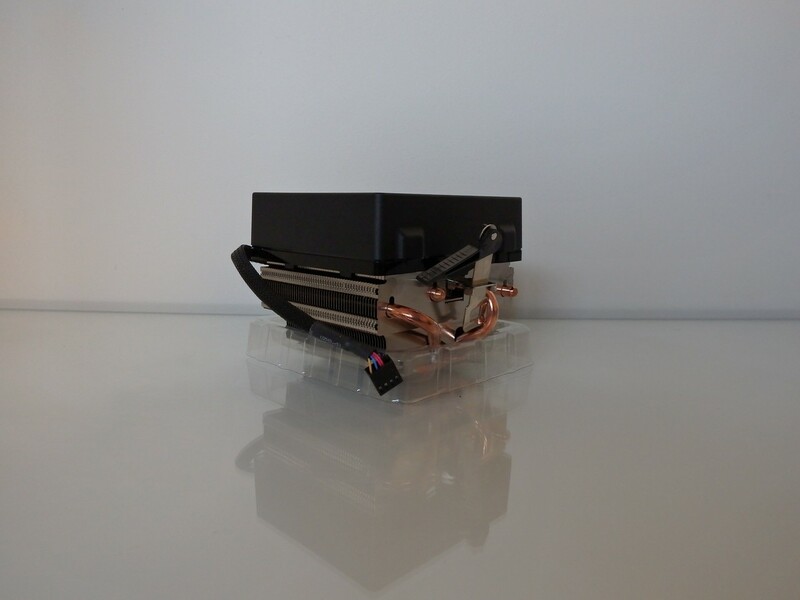 The Cooler Master Cosmos SE case fans are ok but we have a set of Noctua Redux units here that will work in all three fronts; acoustic, performance and aesthetic. The MSI Interceptor DS300 gaming mouse also fits in with the theme and is a legitimate gaming peripheral so don’t be surprised to see more of it in the future. 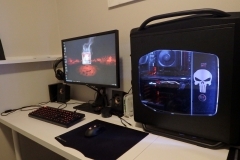 The main change we will be looking to make will be the graphics card – we are already on the prowl for something better matched to gaming at 2560×1440 or higher. 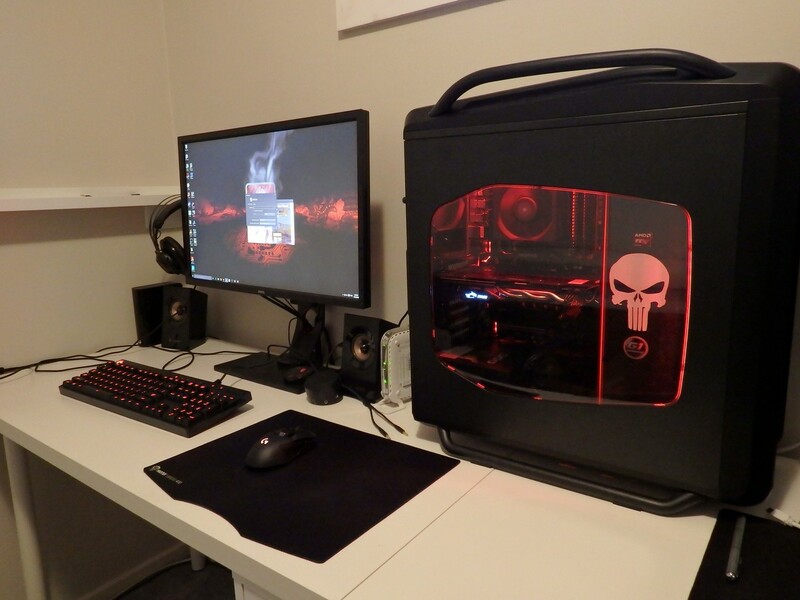 Watch this space for more updates on our AMD test bench and if you do have a question or would like to see how a title performs on the rig, please drop us an email at feedback@pcgamers.net.au or feedback@pctechreviews.com.au so that we can include your question in future updates.